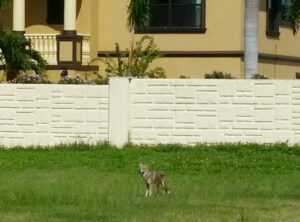 Coyotes are found throughout Florida, including right here in Redington Shores. This adaptable animal belongs to the dog family and resembles a small German shepherd. In Florida, coyotes typically weigh between 15-30 pounds. They have pointed ears, a narrow muzzle and a bushy tail. Males tend to be larger than females. Coyote fur is usually grayish-brown but occasionally is black. When running, the coyote usually holds its tail at “half mast” or straight out behind it, unlike most domestic dogs. Coyotes can be curious but are also timid and generally run away if challenged. Just remember that any wild animal will protect itself or its young. Never initiate a close encounter with a coyote. Coyotes typically are shy and elusive, but they occasionally can be spotted either alone, in pairs or in small groups where food is readily available. Coyotes remain active year round. Coyotes do play an important role in the ecosystem by helping to keep rodent populations under control. The information and literature below can be helpful in preventing problems from coyotes. Coyotes are medium-sized mammals in the same family as dogs, wolves and foxes. Their fur is generally salt-and-pepper gray, with tan or brown patches. They have a thick, bushy tail, long, pointy nose and pointy ears. Adults in Florida weigh between 20 and 35 pounds on average, and males are generally larger and heavier than females. Coyotes are found in several habitat types and are common in rural, suburban, and even some urban landscapes. According to a 2007 FWC report, the presence of coyotes has been documented in all 67 Florida counties. Have there been encounters between people and coyotes? Encounters between people and coyotes in Florida are occurring more often. As coyotes become used to people, they may lose some fear of people, so sightings of coyotes during the day may increase. Coyotes also become more difficult to scare away if they lose their fear of people. But, like other wild animals, that tendency will vary from one coyote to another. Several coyote attacks on dogs and cats have been reported over the past few years in Florida. In some cases, pet owners were present at the time of the attack. However, no humans have been the target of attacks in Florida. What should I do if I’m approached by a coyote? Coyotes are not large animals and rarely pose a threat to people, especially adults. Using common sense around coyotes and other carnivores is the best protection against having problems. If a coyote approaches closely, immediately use a noisemaker or shout at the coyote and wave your arms. A solid walking stick, or a golf club, is a powerful deterrent at close range. Throwing stones, a strong spray from a water hose, pepper spray, or a paintball gun also can be good deterrents. A “coyote shaker” or an air horn can be effective noisemakers. You can make a coyote shaker by placing a few washers, pebbles or pennies in an empty drink container. What should I do if a coyote approaches my child? Adults can yell loudly first and then move toward the coyote. In many cases, an adult who yells and approaches quickly can startle the coyote. That can give the adult a chance to lift the child as quickly as possible. That adult then should be prepared to back away from the coyote while being ready to defend himself, if necessary. How can I protect my pets from coyotes? Don’t allow your dogs or cats to roam freely. Most coyote attacks on pets occur either at night or in the early evening and early morning hours (that is, dusk and dawn). During those times especially, be careful if you’re going to walk your pet in wooded areas or areas where there are a lot of other plants growing, which could hide coyotes. Also, keep your dog close, on a short leash. Keep cats indoors. When cats roam freely there is an increased risk that they could be attacked by coyotes. Be cautious if you are going to pick up your pet when you see a coyote. Picking up a pet may stop a coyote attack, but it can also lead to a situation in which an aggressive coyote continues to go after that pet while in the arms of a person. A well-maintained fence may assist in keeping coyotes out of yards. If pets are kept in a fenced yard, be sure the fence is high enough to prevent coyotes from jumping over it. Also, check the bottom of the fence regularly to make sure there are no holes that would allow coyotes to get underneath. Consider adding an electrified fence if you think additional protection is needed. How can I report a coyote attack or encounter? You can report the incident to the Florida Fish and Wildlife Conservation Commission by calling the regional office nearest to you or by calling 1-888-404-3922. What if a coyote has become a nuisance? The most effective ways to reduce problems with coyotes involve removing food or other attractants. Seeing a coyote in your area should not be a cause for concern because coyotes are common and will continue to exist near humans. However, if a coyote has lost its fear of humans or continues to be a problem, lethal control measures may be necessary. Such methods should be directed at specific coyotes or toward coyotes in a specific area. What methods can be used to remove coyotes from an area? Hunting and trapping are allowable methods year round for dealing with coyotes on private lands in Florida, or a professional trapper can be hired to remove coyotes. An FWC permit is required to use a gun and light at night or use steel traps. FWC does not license nuisance wildlife trappers but does maintain a list of trappers that have registered their contact information. The USDA Wildlife Services also can provide assistance with wildlife trapping; call 1-866-487-3297. Why won’t FWC just eradicate coyotes? Research from Florida and other states has shown that removing coyotes is an inefficient and ineffective method to control local coyote populations. This is because coyotes can compensate by increasing litter size and new coyotes can move into habitat others have been removed from. For these reasons, removal efforts have to be continuous or coyote populations can quickly return to their original size. What can my community do to minimize nuisance coyote problems? to encourage fear of humans, securing food sources such as trash, and protecting small pets. FWC would be happy to provide education materials and possibly organize a workshop to educate your community about coyote presence in Florida. What may attract coyotes to my neighborhood? Coyotes are highly adaptable and smart. They may live in wooded or other habitats near your neighborhood. Coyotes often go where there is food. Never feed coyotes, intentionally or unintentionally. Coyotes can be attracted to pet food that is left outdoors. They may be attracted to garbage, or to the rodents and other animals that are attracted there. Keep garbage cans sealed and eliminate other potential sources of food to help avoid attracting coyotes. Coyotes are opportunistic, generalist feeders. They have been known to feed on rodents, rabbits, lizards, snakes, insects, white-tailed deer fawns, small wild pigs, grasses, fruit (watermelon, persimmons and wild berries), grains, fish and carrion. They have also been known to prey on livestock, mainly calves and sheep. What are some of the specific behavioral habits of coyotes? They are more active at dawn and dusk but can be seen almost anytime during the day or night. Coyotes can occur singly, in pairs or in small family groups. Home ranges typically average 5-10 square miles. They breed once per year during winter months, denning in thickets, brush piles, hollow logs or burrows. Pups are usually born in spring after about 60 days of gestation; litters average six pups. When did coyotes first appear in Florida? People brought coyotes into Florida as early as the 1920s for pursuit by hunting dogs (it is no longer legal to import coyotes from other states). Regardless of those introductions, the coyote’s range expansion into Florida was inevitable. The 2007 FWC report describes coyotes as a naturalized species because evidence suggests that natural range expansion occurred from west to east across the panhandle then south through peninsular Florida rather than expanding from release locations. It is also interesting to note that fossils have been recovered in Florida that indicate coyotes were in the state until about 10,000 years ago. The range expansion of coyotes in Florida and the rest of the country, is the result of several factors. For example, coyotes will eat many different types of food, and there have been widespread changes in habitat, which have created more places for coyotes to live. Also, red wolves are no longer present, so coyotes have less competition to deal with. Coyotes also benefit from having a large number of pups in each litter (an average of 6 pups, but that number can range from 2 to 12) and a short amount of time before pups reach adulthood. What are the major impacts of the coyote in Florida? Coyotes have not caused major changes to Florida’s ecosystems (that is, no extinctions or large declines in numbers of any native species). However, when they prey on threatened or endangered species (for example, on sea turtle eggs), localized control measures have been required. It seems that coyote numbers have stabilized in North and Central Florida, but their numbers may continue to increase somewhat in South Florida because coyotes reached that area more recently. Are there any benefits to the presence of coyotes in Florida? Predators like coyotes are important in the natural systems where they live. For example, coyotes often prey on rabbits and rodents, which can be pests to farmers. Coyotes also can be a benefit for many bird and small mammal species because, as a larger predator, coyotes may control smaller predators such as raccoons, foxes and feral cats that prey on native small mammals, birds and bird nests. The red wolf has been eradicated from Florida and some biologists believe that its role has been partially filled by coyotes because they prey on some of the same species and may interact with competing carnivores in a similar manner. Where can I find more information about coyotes? The FWC website has a section with information about coyotes. You can also review the literature at the bottom of this page.